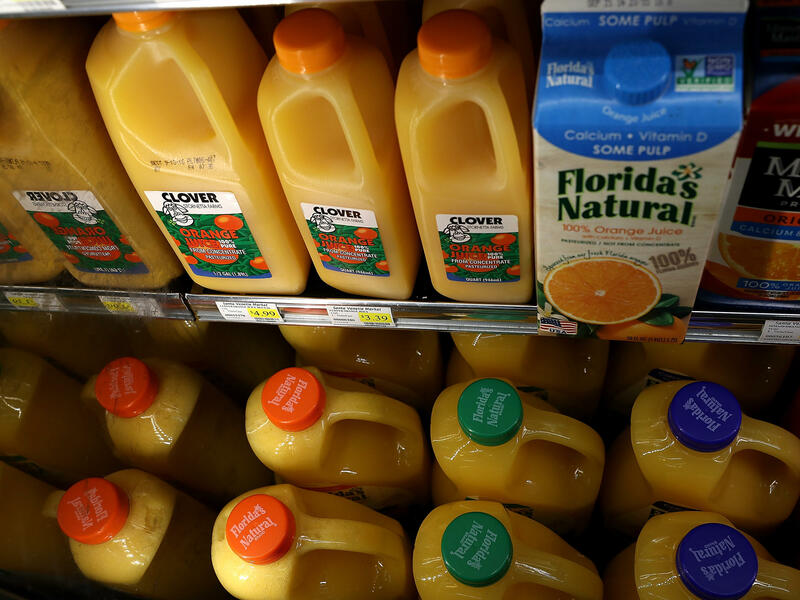 Orange juice is among the U.S. products that may be subject to retaliatory tariffs by the European Union. "Table, kitchen or other household articles, and parts thereof, of stainless steel ((excluding) cans, boxes and similar containers of heading 7310; waste baskets; shovels, corkscrews and other articles of the nature of a work implement; articles of cutlery...)"
"Sea-going sailboats and yachts, with or without auxiliary motor, for pleasure or sports"
"Cranberries 'Vaccinium macrocarpon, Vaccinium oxycoccos, Vaccinium vitis-idaea', prepared or preserved, not containing added spirit nor added sugar (excl. jams, jellies, marmalades, pure and pastes, obtained by cooking)"
"T-shirts, singlets and other vests of wool or fine animal hair or man-made fibres, knitted or crocheted"
"Women's footwear with outer soles and uppers of leather, with a vamp made of straps or which has one or several pieces cut out, with a maximum sole and heel height of <= 3 cm, with in-soles of >= 24 cm in length (excl. with uppers which consist of leather straps across the instep and around the big toe)"
"Rear-view mirrors, whether or not framed, for vehicles"
"Men's or boys' bib and brace overalls, of cotton, industrial and occupational (excl. knitted or crocheted)"
"We will not sit idly while our industry is hit with unfair measures that put thousands of European jobs at risk," European Commission President Jean-Claude Juncker warned after Trump promised to impose the steel and aluminum tariffs. "The EU will react firmly and commensurately to defend our interests." The EU is seeking comments from industries affected by the U.S. tariffs, which exclude steel and aluminum from Canada, Mexico and Australia. The EU could then decide to impose new tariffs or increased customs duties on the listed U.S. products.